Do you get nutty around the holiday season? The holidays can be a little crazy with 24 hours shopping, visits to Jolly Saint Nick, bustling malls, holiday parties, and of course food galore! I get to see some of my favorite foods come Thanksgiving, Christmas, and New Years including at least a few “nutty” snacks. Have you made a Gingerbread house? Baked a Pecan Pie, or candied nuts before? Neither have we! Today, we’re going to learn a little bit about how to prepare a few of these holiday snacks just in time for our next holiday party. You can no doubt run into the store and buy a bag full of pre-made glazed nuts, but what’s the fun in that? In fact if you walk through our warehouse at the Los Angeles Wholesale Produce market you’ll see both bulk and 16 oz packages of our butter toffee peanuts. For directions to put it all together check out Allrecipes.com. I’m sure if you wanted to be a little creative you could add a few other types of nuts to the mix. 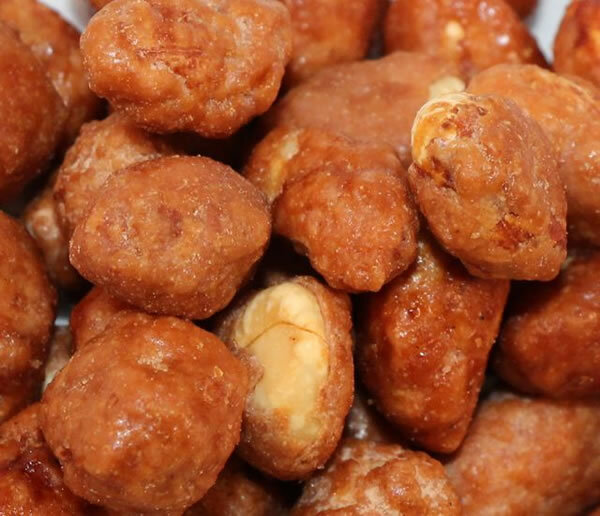 This recipe looks like it wouldn’t take much more than 45 minutes just liked the Glazed Nuts. Check out the complete recipe on DavidLebowitz.com. You’ll need Walnut Halves and Pecan Halves to make the Spiced Holiday Nuts recipe. “Line baking sheet with foil. Lightly oil foil. Heat 2 tablespoons oil in large nonstick skillet over medium heat. Add ginger, curry powder and cayenne pepper; sauté until fragrant, about 5 seconds. Stir in sugar and honey. Add nuts. Stir until honey mixture is amber in color and nuts are well coated, about 6 minutes. For the full recipe and reviews check out Epicurious.com. Very much a staple of the holiday season, but are nuts really an important part of the Gingerbread House? I thought it was full of candy, cookies, and crumbs? Well folks, to the creative mind the common nut is just as important as the gum drop, candy cane, or colorful m&m. Last, but not least and something I dare say I’m a bit fearful to try is the Pecan Pie. Now this is something that actually may require some skill to bake. I might have to hand this recipe off to a more experienced cook to get the desired results. One thing is for sure…the Pecan Pie is definitely a “Nutty” holiday food. Midlifebloggers.com caught my attention when I came across their recipe for Pecan Pie. After all who wouldn’t want to Wow them at Thanksgiving with the Best Pecan Pie in the World? What are the two big secrets to the Best Pecan Pie in the World? The Secret, Part I is in the pie pan. You cannot NOT CAN’T use a regular pie pan. Get a fluted tarte pan with a removable bottom. They’re not expensive; you need one anyway because you can use them in the summer to make all sorts of fruit tartes. The Secret, Part II: You’re not going to use most of the syrup. Yes, it will pain you, as it does me, to throw that over which you have labored away, but that’s what makes this pie so incredible, so different from your average goopy pecan pie. The two big secrets are revealed! Now head on over to Midlifebloggers and check out the rest of the recipe. Those are the 5 “Nutty: Holiday Snacks! Since we recently moved into our new Eichler home we are planning on having several parties this holiday season to showcase our house. That will give us the opportunity to try one if not more of the above recipes. We’ll report back of any successes or failures here on the blog. Do you guys have any “Nutty” holiday snacks you’ve made in the past? If so, tell us about it in the comment section below.